Grande has been through the wringer the past two years, and has made it out the other side with a mess of emotions and two hit albums in six months. 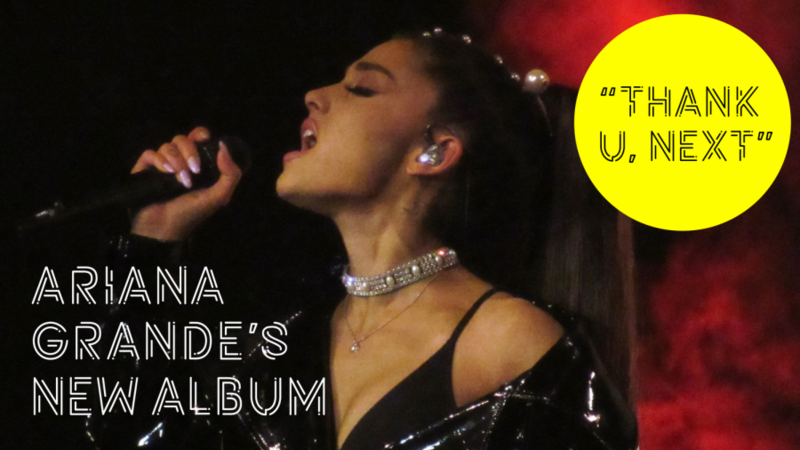 The Manchester concert bombing, the death of her ex-boyfriend Mac Miller and her whirlwind engagement and very public breakup with Pete Davidson have left Grande feeling a little upside-down, which is reflected in her cover photos for both “Sweetener”and “Thank U, Next.” However, on the “Thank U, Next” cover, though she is still upside-down, she seems like she’s into it. From all this pain and heartbreak, Grande has gone to the place she feels most safe: the studio. It has been a very emotional time for the singer, but it has also been a time where she has been able to find her own voice in the rigid music industry. When Grande released the two singles for this album, “Thank U, Next” and “7 Rings,” she became the third artist (along with Drake and Mariah Carey) to have two songs debut at number one.She is absolutely blowing up right now, and people are drawn to her more than ever before. In just the past few months she has gained 4.2 million followers on Twitter. Because of her enormous social media following, Grande no longer has to follow the traditional promotional cycle for female pop artists in the industry. She can do whatever she wants. Grande told Billboard, “I just want to f***ing talk to my fans and sing and write music and drop it the way these boys do. Why do they get to make records like that and I don’t?” With “Thank U, Next,” Grande has finally broken free from the restrictions that the music industry places on female pop singers to follow the pattern of a single, then an album, then a tour. “Thank U, Next” is 100 percent the vision of Ariana Grande. This is an album full of emotion, but of course Grande also included some playful bops, like “Bloodline,” “Bad Idea,” “Makeup,” “7 Rings,” “Break Up with Your Girlfriend, I’m Bored” and the titular song “Thank U, Next.” With these tracks Grande uses her sexual nature to evoke her liberation from everything that has been holding her down in life (past relationships, the music industry, etc.). According to one of the songwriters who worked on the album, Njomza, the studio was full of “boss female energy.”The final track, “Break Up with Your Girlfriend, I’m Bored” is the perfect way to end this emotionally taxing album. It gives off a similar vibe to Britney Spears’ “Get Naked (I Got a Plan).”After all the pain, heartbreak and longing, Grande finishes her album with a flirtatious anthem for everyone who has ever felt that way but has been too afraid to say it. After years of building a name for herself in the music industry with studio albums overproduced by other artists’ influence, Ariana Grande is finally showing her true colors to the world in “Thank U, Next.” From all the chaos in her life has come her best album yet, and all her fans are eagerly waiting to see what she has in store for the future.